Quite a few things have changed since India and Pakistan last met in an epic 2017 Champions Trophy final where Pakistan, against all odds, walloped India by 180-runs at the Oval. Pakistan have further enhanced their reputation emerging as one of the better bowling sides going around in the 50-over format. India, on the other hand, have shed old leaves, nurtured a few green ones and are better prepared to face their arch-rivals than they were before. A. How India's right-handed heavy batting line-up faces up to Pakistan's left-arm heavy fast bowling unit. B. How Pakistan counter the Kul-Cha threat. There are as many as four left-arm fast bowlers in Pakistan's ODI squad for the 2018 Asia Cup. Usman Khan and Mohammad Amir, who started against Hong Kong in Pakistan's first match of the tournament, are certain to feature while Junaid Khan is a good shout given his record against India. India's right-hand heavy batting line-up have had a fair share of problems against quality left-arm seam. The average per dismissal rate of several of their batsmen against left-arm pacers is way lower than that against right-armers and this should encourage Pakistan who have a whole array of them. Rohit Sharma, the Indian captain, tends to fall over when flicking and has a discernible weakness against balls swinging into him. This was on display during the 2016 Asia Cup and then again at the Champions Trophy final last year when he played all over Amir's inswinger to be trapped in front for a duck. Since then, the opener has been dismissed by left-arm fast bowlers seven times - Trent Boult thrice, Jason Behrendorff, David Willey, Mustafizur Rahman and Vishwa Fernando once each - across formats at an average of 21.17 per dismissal. KL Rahul, Manish Pandey, Ambati Rayudu and Virat Kohli (rested from the Asia Cup) all have lesser career averages per dismissal against left-arm pace than right-arm. Dhoni, who thrives on gritting it out when the top-order has folded, is the only one who has a decent record against left-armers, one that is largely boosted by a sensational hundred in Chennai six years ago against a Pakistan seam attack comprising Junaid Khan and Mohammad Irfan. India's woes against left-arm seam is well documented and it is this record that could catapult a third seamer - Junaid Khan - into the Pakistan starting XI on Wednesday. However, they might need to be a bit wary of being one-dimensional, despite what Boult, Willey and Behrendorff have done to India in the recent past. 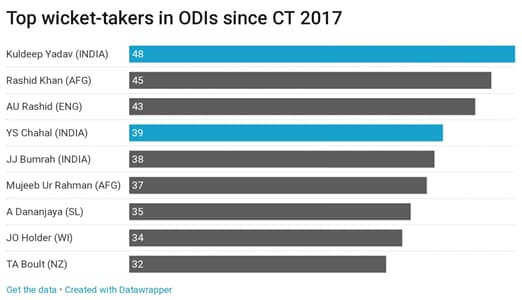 Between the 2015 World Cup and the end of 2017 Champions Trophy, India lost 34 wickets in all to left-arm fast bowlers in ODIs with a wicket coming off every 35th ball statistically. Since then, though, this has dropped down to every 49 balls. 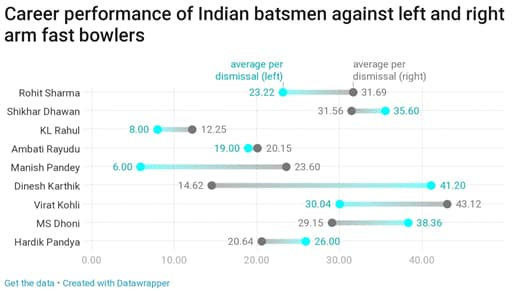 In terms of average and economy in comparison to right-arm pacers as well, India have become better against left-armers since that Champions Trophy final. Another notable statistic showing that India have become better at handling left-arm pace is the going up of the economy-rates in recent times. A clear example of how India have turned this around is analysing the ODI series against New Zealand last year. In Mumbai, Trent Boult dismantled India’s batting with 4 for 35 but a remarkable turnaround saw him remain wicketless in the next two ODIs while conceding 54 and 81 in his quota of overs. Amir’s indifferent form (3 wickets in 8 ODIs since the Champions Trophy final) and a rejuvenated Indian batting line-up could see the threat Pakistan's attack pose being negated at Dubai, a place where lateral movement and swing, two of India's major nemesis against left-armers, are minimal. Pakistan have their task cut out facing a new-look Indian bowling attack spearheaded by the impressive wrist-spinners, Yuzvendra Chahal and Kuldeep Yadav, both of whom weren't around during the Champions Trophy. Since taking over from Ravichandran Ashwin and Ravindra Jadeja, Kuldeep and Chahal, nicknamed as KulCha, have been the architects of several Indian victories. The unusual wrist-spin combination has worked wonders for India in limited-overs cricket and this is evidenced by a phenomenal period which has seen them lose just one ODI series (out of seven) and six T20Is (out of 23). The spin twins have been pioneers in this metamorphosis, picking up 87 wickets between them in ODIs. Since the Champions Trophy in 2017, the duo are among the top four wicket-takers in the 50-over format. Pakistan have had their fair share of issues against wrist-spin, especially since the last World Cup in 2015. Adil Rashid, Jeffrey Vandersay, Adam Zampa, Todd Astle and Akila Dananjaya have enjoyed plenty of success against the Men in Green during this time frame. Fakhar Zaman, despite his terrific run in ODIs, has fallen to wrist-spin five times in his career already - Rashid and Dananjaya being his nemesis. Imam-ul-Haq has faced few quality wrist-spin in his career so far while Shoaib Malik's average against leg-spin is pegged back by three wickets conceded to a certain Sachin Tendulkar. Sarfraz Ahmed, another key batsman in the line-up, has fallen to wrist-spin seven times, including four times to Adil Rashid spread across two series. Sarfraz also fell to the Kiwi leg-spinner, Astle, twice in the ODI series between the two teams in 2018. Asif Ali, the finisher in the line-up, hasn't faced much of wrist-spin in his short international career and Chahal's tendency to lure big hitters with his widish leg-breaks could be something that Ali needs to be careful of. Babar Azam, with a compact technique has a decent record against wrist-spin (two dismissals against them in career) and seems to be only in the Pakistan side that can counter the spin twins. If this wasn’t enough to worry the de facto hosts, facing Kuldeep Yadav for the first time should. Yadav has an incredible record in the first game he plays against most teams. Starting with an impressive 4 for 68 on Test debut against Australia to a 5 for 24 versus England in his first T20I against them, Kuldeep has been a real tough nut to crack for most teams facing him for the first time. Pakistan are yet to face Kuldeep, whose variations and consistency has taken the limited-overs format by storm. That he belongs to a rare category of bowlers further compounds Pakistan's challenge. If he can keep his record against new teams going, the result of Wednesday's encounter might well go in India’s favour.